Sidelined All India Anna Dravida Munnetra Kazhagam (AIADMK) leader TTV Dinakaran on 24 November said he would take back the 'two leaves' symbol of the party which was allotted by the Election Commission of India (ECI) to the faction of the party led by Tamil Nadu Chief Minister E Palanisamy and his deputy, O Panneerselvam (EPS-OPS faction). 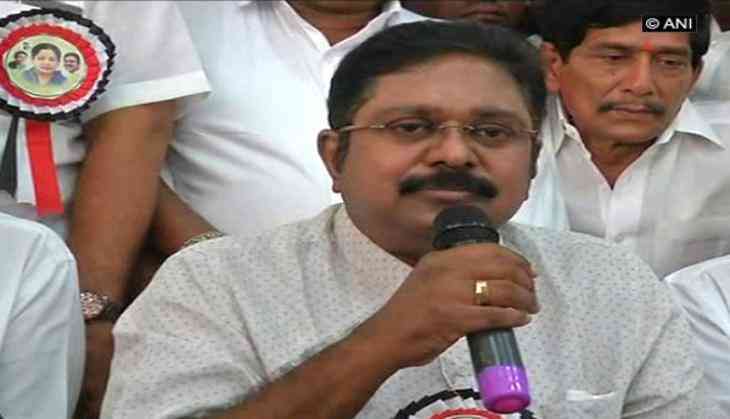 While addressing party workers here, Dinakaran said, "I will win in RK Nagar by-election and take back 'two leaves' symbol." In an 83-page order, the election watchdog had ruled that the EPS-OPS faction would be entitled to use the name of the party and its reserved symbol, holding that it enjoyed majority in the party's legislative and organisational wings. The other faction led by Dinakaran had also laid claim over the symbol after a power tussle ensued in the party following the death of Jayalalithaa. Dhinakaran is also facing court case in the two leaves symbol bribery case. The Delhi Court on Thursday pulled up the police once again for not filing supplementary chargesheet Dhinakaran in the two leaves bribery case, who was granted bail on June 1 after being arrested on April 25. According to police, arrested middleman Sukesh Chandrashekhar had tried to bribe Election Commission officials to get nod for using two leaves election symbol for Sasikala's faction of the AIADMK. Meanwhile, the EC on Friday fixed 21 December as the polling date for the RK Nagar by-elections. The seat of RK Nagar fell vacant following the death of former Tamil Nadu chief minister J Jayalalithaa in December 2016, who represented it for two terms. The election was earlier scheduled for 12 April but was cancelled following allegations that sums of money were distributed in a vote-for-cash scam.